Kensington Regeneration produces a number of publications that are available free of charge to local residents and anyone else with an interest in the work of the Partnership and life in the area. These publications range from Kensington News, the local community newspaper, to a guide to services and facilities in Kensington, for residents moving to the area from abroad, that is available in eight different languages. Click to download the latest electronic versions (PDF) of all Kensington Regeneration’s key documents. If you are using Windows you will need software to view the PDFs, you can download Adobe Reader here. 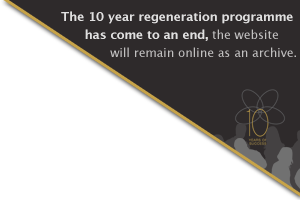 The End of Programme Brochure tells the 10 year story of Kensington Regeneration, highlighting the many successes achieved through a partnership approach with the local community. You can read about all the winners' stories in this commemorative brochure. They show how determined individuals and organisations have been to make a difference in the area, and demonstrate all that's best about community spirit in Kensington. A summary of Kensington Regeneration’s achievements in the last financial year in an easy-to-read format. The report includes all the major developments of the year, key facts and figures and a look ahead to the partnership’s priorities in the final 12 months of the programme. A useful publication for anyone living or working in Kensington. Full listings of the area’s services and facilities arranged thematically - community groups, residents’ associations, education and learning, sport and health, religious organisations, youth organisations and public sector agencies. Just looking for a bit of it? Find out about all the latest decisions that have been taken by the Kensington Regeneration Board by reading the latest Board minutes. Up-to-the-minute information that might not yet have appeared in publications such as Kensington News or in the local press. A comprehensive guide to the various methods used by Kensington Regeneration to communicate with key stakeholders in the area. Find out about everything from corporate identity and branding to text messaging, forums and festivals in this useful summary document. Kensington Regeneration has had a very positive impact on life in its operating area over the past ten years, according to a new independent report by the European Institute for Urban Affairs. This executive summary of the report looks back at the Partnership¹s work, and the changes for the better it has helped to bring about with the help of New Deal funding from the Government. A useful publication for refugees, asylum seekers and other people moving to Kensington from abroad. Provides an in-depth guide to ESOL (English for speakers of other languages) services in the area. Improving their English can help residents to get more out of their life in the UK. The Kensington Regeneration factfile - an at-a-glance guide to all the important developments of the last nine years. A summary of how the Partnership operates and details of all its major successes and achievements. Contains a host of key facts and figures about the organisation. Kensington Regeneration in pictures. The images in these galleries have been selected from the thousands in the archive to provide a flavour of the wide-ranging work of the partnership and its projects over the past nine years. A photographic review of the change for the better in the area. Kensington News is the regular community newspaper for the area. Produced by Kensington Regeneration, this bi-monthly publication includes a wealth of useful information about the latest local developments, new opportunities for residents and upcoming events.